hile the hooded nib of the Parker “51” was preferred by the vast majority of the customers, there were still a lot of people who liked the sight of the open nib. This was especially true in Europe. For the same reason Parker had offered the Parker “VS” as a complement to the hidden nib of the Parker “51”, which was ment to replace the somewhat dated Vacumatic (Vacumatic Successor). 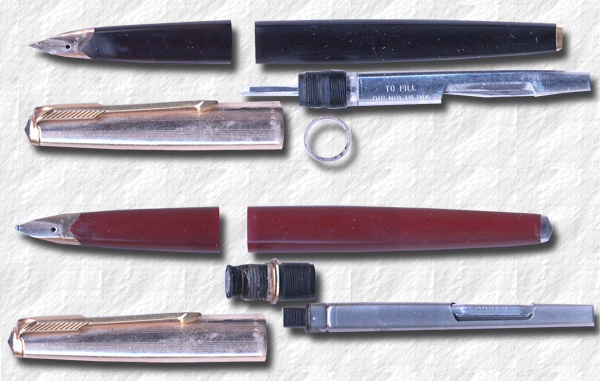 There are several examples of prototype Parker “51” style pens with open nibs in the Parker Archives. The same ideas were true during the 1960’s when the Parker “61” was selling in great numbers. Its design was based on the Parker “51”, which was still being offered, but the Parker “61” had a slimmer body and of course the legendary capillary filling system with non-moving parts. Well, this filling system had caused the Parker repair department much trouble when the filler units got old and many pens clogged up, rendering them unusable. 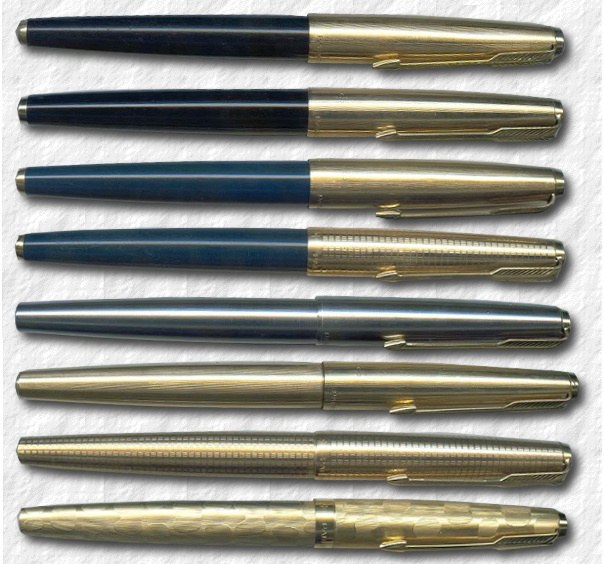 Nevertheless Parker in the UK decided that there was potential for a new style of pen, based on the Parker "61" and in 1967 the Parker "65" was introduced. It was very similar to the Parker "61", but had a semi-flexible open nib. The ball point pens offered were made to compliment both the sister lines Parker "61" and "65". lso in 1967 Parker in the UK introduced a very attractive gold design called Consort, a cap that held twice the gold of the Insignia, in 12 carat rolled gold cap and barrel in an intricate "brick" or grid pattern with deep lines. This replaced the last of the rainbow caps: the Heirloom (in green and pink gold), which was discontinued. Hence there are no Parker "65s" with rainbow caps. The first Parker “65” (MK I) unpredictable enough had a filling system which was developed for the Parker “VP”, a short lived model that was introduced in 1962 and discontinued in 1964. With the "VP" Parker had tried a new kind of “clean” filler, a removable converter that, as opposed to the standard converters, ended in a long, thin tube that the user would insert into the bottle, compress the sac inside the filler and then replacing the filler into the pen. Parker "65" from the top: Solid gold Fine Barley (Gain d'Orge), Waterdrop (Perlé), Flammé (fountain pen, pencil and ball pen), Chevron (Basketweave); gold filled Insignias: Cirrus, Stratus and Cumulus; Consort Insignia, Custom Insignia and Flighter DeLuxe. t was made from a clear plastic and contained a thin rod inside to provide capillary action while writing. It looked a lot like the Parker "51" aerometric filler, but was not a true aerometric. It sounded like a nice, simple solution but the thin, plastic tube that was to forcibly be inserted into the back of the ink collector every time the pen had been filled was very prone to breakage and the Parker After Services was instantly overwhelmed with broken Parker "VP"s. These first Parker "65s" can not be used with cartridges and they had shorter filler units and feeds that are not interchangeable with later models. Maybe Parker in Newhaven had a lot of leftover VP-fillers, anyway the Parker "65" wasn't advertised as having a removable filler. In any case the VP-filler version Parker "65" was discontinued very soon and is quite rare. It was replaced with a model (MK II) that had a Parker "61" style, longer feed, with an integral piercer, to accommodate the standard cartridges, but it was still not identical to the Parker "61" and, again, not interchangeable, since the threads for both the barrel and shell were finer than on the Parker "61". In 1968 a Consort Insigna was introduced for both the Parker "61" and "65" lines, it was an all gold model in the Consort design. n 1969 the Parker "61" and "65" lines were redesigned. The legendary capillary filling system was discontinued on the Parker "61" which was fitted with a cartridge/converter in the manner of the Parker "45". The capillary "61" was one of the last Parker models that didn't take converters (neither did the later Parker "105", for other reasons). The inner cap was also redesigned this year, but the new design proved disastrous on the Parker "61", since it fit so snug to the section that it sometimes scratched the inlaid arrow or even dislocated it. The connector was now in black plastic and the barrel threads was also different. The Parker "65" was changed in the same manner, but since it never had the section arrow it wasn't affected by this design flaw. The connector on the (MK III) Parker "65" now had a coarser threading and for the first time all the internals of the sister pens, save the nibs and feeds, were interchangeable. Two different tools are required to dismantle the MK II and MK III Parker "65". Also a Parker "65" Holy Water dispenser was offered. It was an ordinary pen, but had a small chalice instead of a nib. A Parker "65" Holy Water dispenser. These are more common than the Flammé and Chevron, since the 9c Presidentials were made in all four designs, while the 18c Presidentials were made in Fine Barley and Waterdrop finishes only. In 1972 the Consort and Consort Insignia models were discontinued, together with the old workhorse, the Parker "51". The gold and gold filled pens all had black sections. These were offered only as fountain pens and ball pens. The felt-tipped Parker "65" was also introduced, but of the cloud models, the Felt tip was offered as a Cirrus, only. The Presidential Parker "65s" and the cloud collections were also produced in the French Parker factory in Merú, and there are small changes in the finishes within the same models. Top: the "VP" filling system. Bottom: the converter filling system. Already in 1979 the felt-tipped Parker "65s" were being phased out, only the Cirrus and Flighter DeLuxe fibre tip pens remained. Also the Custom Parker "65" was discontinued. n March of 1980 the cloud series, Cirrus, Stratus and Cumulus were being phased out. Now only a few Parker "65" remained. The finishes were still: Fine Barley and Waterdrop for the 18c versions and all four, Fine Barley, Waterdrop, Chevron and Flammé for the 9c version. The Parker "65" with time showed two design flaws. One was in connection with the small, gripping section lip that covered the top of the nib. The relative flexibility of the open nib eventually created a separation between the nib and lip, rendering an ink flow problem. Also the space between the ink connector and gripping section had to be sealed with wax to prevent leaking. This wax wasn't always re-applied when the pens were eventually cleaned, which made them leak in the crack. Also an un-experienced repairer that tried to remove the nib without using the special tool (the connector is un-screwed from the inside of the gripping section) would inevitable crack the section lip. Hence many Parker "65s" has this lip missing or cracked. n December 1982 the Parker factory in Toronto closed down production and assembly line. Only distribution and repair remained. There was a worldwide recession on Parker sales and Parker's Writing Instrument Operations was losing money for the first time ever. In an effort to cut costs 25% of the worldwide work force was made redundant. 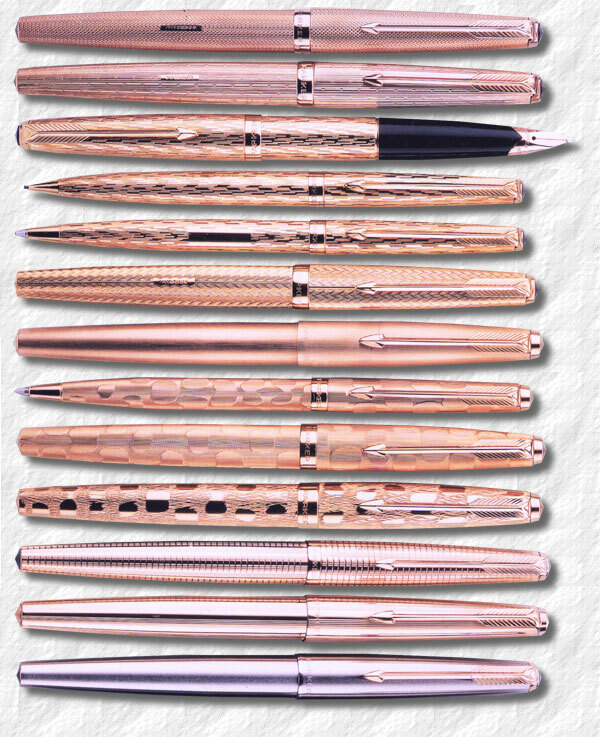 In 1982 all the Parker "65" models, except the Presidentials were discontinued. 1983 Parker attempted a reconstruction and early retirement plan in Janesville in the US and Newhaven in the UK and they also recentralised the research and development department to Janesville. Several pen models also saw price reductions in 1983.
everal models and designs were discontinued during 1982-1983: the Parker "85", Parker "105", the Parker "50" Falcon, and also the expensive Laque collection of the Parker "180" and Parker "35" was discontinued as well as the expensive TX of the Parker "45". In 1983 both the 9 and 18 carat solid gold Presidential Parker "65" were discontinued. They were the last of the Parker "65"s.
The Parker "65" are very much collectible, especially the solid and gold filled models, and since they were sold maily in Europe and in the Commonwealth, they fetch rather high prices in the US, although rather common in the Classic and Custom finishes in Europe.